In nine ball, only balls 1 through 9 are racked. The 1 ball is placed at the rack’s apex and the 9 ball is placed at the center. This setting requires a specific style of rack shown here, known as the 9 Ball Rack. 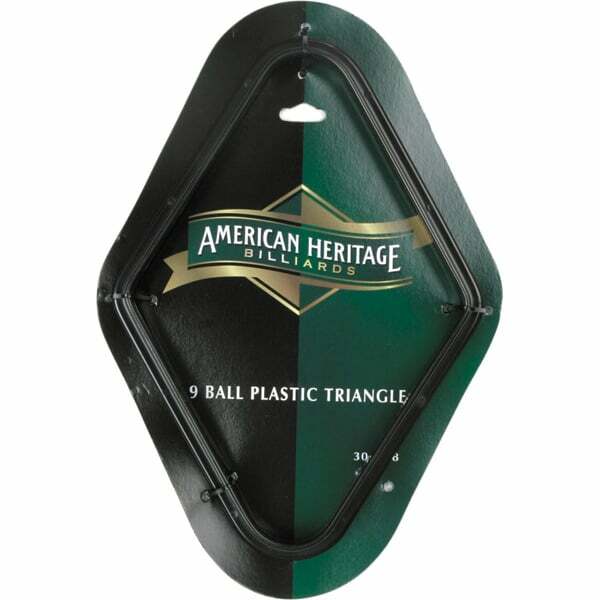 The American Heritage option is made with high impact resin, as it is the best performing material available. It cannot splinter or crack like wood, and it performs perfectly even with exposure to water, sunlight, and pool balls running at high speeds. Most high functioning pool tables are equipped with both a 9 Ball Rack and an 8 Ball Rack. Keep your game room equipped with all of the preferred gaming accessories to accommodate guests and enliven competition!